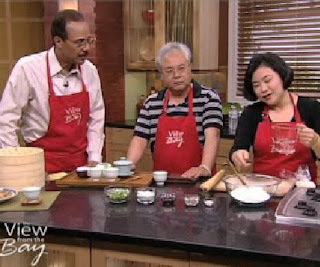 Yesterday Grace and Roy appeared with host Spencer Christian on KGO-TV's "View from the Bay" cooking show here in San Francisco. Grace made green onion pancakes, while Roy brewed Jasmine Pearl tea to accompany the tasty snack that's a favorite in our Berkeley teahouse. Mix flour and water well. Form into a ball, then cover and let rest for about 20 minutes. You will have about a pound of dough. Divide dough into three parts and roll out thin, like pizza dough. Sprinkle with salt to taste. Brush lightly with oil. Spread the chopped onions on top. Fold over one edge and roll up like a small jellyroll, closing the ends. Hold both ends and twist by hand until each roll feels tight, then flatten the roll. Cover and let rest 10 minutes. Roll out flat to form pancakes that are 6 - 7 inches in diameter. Heat a small amount of oil in a heavy skillet. Place one pancake in skillet and cook over medium heat for about 4-5 minutes, until pancake bottom is golden brown, then flip over and cook the other side. Yields about three pancakes. Cut into pizza-like slices and serve hot. Spicy food lovers may want to serve slices with our Chili Sauce. For a truly Beijing-style snack, pair with jasmine tea!